YOUR SAY: Is the Prespes Agreement really a resolution of the long-standing name dispute? Brady Kiesling, respectfully, I do not agree with your stance. Please read some more on the history of Macedonia, then you may realise that revisionist history and usurping another’s history is not moral nor “common sense”. I’m very interested in the comment “beneficial to both countries”. I can only see benefits to FYROM and cannot see how Greece has benefitted from this very unpopular agreement. Instead of looking at how this small country got named Macedonia in the first place we are lectured as to what a good decision this agreement is. Why weren’t they called South Serbia or West Albania? Macedonia is Greek and please don’t argue they are to be called “North”. The North will disappear very soon if it has not already done so. In the first sentence the professor talks of a statue of Alexander the Great being erected in Skopje… Why professor? What have Alexander and the Skopjians got in common? Nothing at all!! His article is so “sitting on the fence” that it’s laughable….but what do we expect from a Melville – Jones, go back to our Greece’s long and golden history professor and get your facts right. There is one Macedonia and it is in northern Greece where Alexander was born. FYROM is not Macedonia… It never was and it never will be!!! You know I have never paid much attention to this. Throughout my youth I had friends that were Slav Macedonian. A couple if weeks ago I was flipping through channels on TV and channel 44. Macedonian program was scheduled, I stopped flipping because I thought it was Greek as they were depicting Greek sights from Thessaloniki e.g. Leuko Pirgo, the show wax not Greek, but Slav Macedonian. The fact that they were depicting Greek Macedonian landmarks anger me so much. Read the articles that have been imposed on them. I don’t understand why people are still angry. We are getting all these concessions for the price of withdrawing a veto. As much as we deny it, their name since 1992 was the Republic of Macedonia. Now it will be called the Republic of North Macedonia. Why weren’t people angry when they were given the name FYRO Macedonia? What exactly has changed? Steve Mitsos the veto was our only remaining bargaining chip. Do you understand this? It has now been thrown away. Their nationality, language, and identity is now officially Macedonian (even in Greece) and mine is not. The fact they reluctantly acknowledge it as ‘different to ancient greek’ means jack to me. The world will forever be confused into thinking they are the only Macedonians, solely because we have given up the fight. 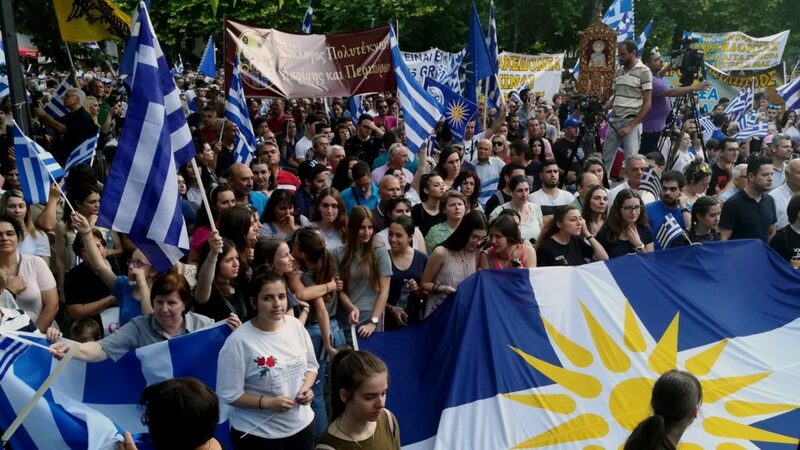 And if you think we weren’t angry with the INTERIM name of FYROM, then I believe you have not seen the many rallies and protests organised throughout the past 30 years. Again, this problem should’ve been solved back in 1992 with a phone call to Milosevic. We are not happy because officially the Greek government and everyone else will recognise their nationality and language as Macedonian which was never the case before! Steve Mitsos, what has changed is the Greek Government has signed an agreement that says: Country: Nth Macedonia; Language: Macedonian; Ethnicity: Macedonian. There never was a Macedonian language or country. Their second language is Albanian .It doesn’t matter how many countries recognise them as FYROM . Greece gave them what they where wanting for years our recognition We have sold out our identity and our history. Macedonia is Greece , not a country that consists of 40 per cent Albanians, 30 per cent Bulgarian, 20 per cent Serbs and 10 per cent gypsies and Turks. This will open up a can of worms with regards to Greek businesses, Μακεδονικός Χαλβάς etc and now some of them want to claim compensation against Greece and it’s only going to get worse what’s next? Θράκη, Ήπειρος, Δωδεκανήσα. I am from Thessaloniki, so now I am Greek from the region of South Macedonia. Steve Mitsos okay so forget 3000 years of Μακεδονία and Greek history and legacy of the Hellenistic world after Alexander’s empire. Change your name Steve, let your neighbour use your name. Forget the blood that was spilt during the Balkan wars to free Μακεδονία from the Komitadji Bulgarians and Ottomans. Why do they claim Μακεδονία when 100 years ago that region was called Vardaska? The whole pseudo state naming of Macedonia in former Yugoslav territory had one objective… to annex our Μακεδονία and gain access to the Aegean. Slavs that erect Greek warrior statues in their capital city, use Greek symbols Star or Vergina, claim to be descendants of Ancient Μακεδονη. Already they are talking about a Southern Macedonia province with ‘ethnic” Macedonians which is complete crap!! The Slavic people that reside in Μακεδονία today in places pike Φλορινα or Καστοριά claim this crap! Yet they are Slavs, left there by the Greek army or government and should have been given their marching orders into Yugoslavia like most of them at the time. Why can’t they accept there Slavic roots and call themselves something else?